It has been proven time and time again that allowing employees to work remotely boosts their productivity and engagement at work. Not only does it lessen their attrition rate, but also increase their work productivity and function. But you may be asking yourself right now, how can you provide that for your teams? Well, the answer to your question is remote desktop technology. By knowing how to setup remote desktop and to add it to your organization, you can maximize your business' efficiency while boosting your employees' competency level. According to Information Technology of Morehouse School of Medicine, remote desktop is a technology that allows you to sit in front of a computer (sometimes referred to as the client computer) and connect to a computer remotely (sometimes referred to as the host computer) from an offsite location. This allows you to do certain tasks as if you're sitting in front of the computer you're trying to remote to. From there, you can fix troubleshoot issues, run apps, and even perform certain administrative tasks. Since remote desktop is found to be an amazing tool that can help maximize one's work efficiency, thousands of businesses are starting to add this technology to their organizations. From multinational companies to learning institutions that offer educational services overseas, remote desktop has been proven to be a useful technology the modern business dynamic need. How to Setup Remote Desktop in various OS? The first thing you need to remember before knowing how to setup remote desktop is that it wouldn't all be possible without having both of the computer devices a good and stable internet connection. You also need to know that in most remote desktop networks and software, you need to have permission first before connecting to the computer you're trying to remote to. Different operating systems have also different approaches when it comes to remote desktop. That's why Windows and Apple provide unique ways on how to setup remote desktop within their own operating systems. With that being said, we'll show you different ways on how to setup remote desktop based on what operating system you're using. 1. Apple - Apple has built-in tools that allow you to know how to setup remote desktop and connect to another computer remotely. However, this shouldn't necessarily be your first and only option as Apple sells stand-alone products that provide remote desktop connection to its customers. These products are typically aimed at professional IT help pros and network managers. If that sounds a bit unnecessary and too much for you, then you might want to consider using Screen Sharing instead. The user you're remoting to could either choose to let you access the screen of his or her device or just let you observe his or her screen. 2. 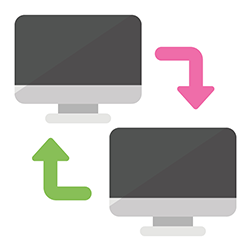 Windows - Windows allows you to know how to setup remote desktop and connect to another computer remotely using Remote Desktop Connection. This app enables users to connect to other computers that are connected to their local network or on the internet. Typically, it is being used for a variety of work purposes one might need to perform in a remote computer. Once the name appears in the Remote Desktop Users dialog box again, click OK, and then click OK again. Note that these steps should work perfectly fine on Windows 7, 8, and 10. 3. Third Party Tools and Software - One way of knowing how to setup remote desktop is through a third-party software. Now that remote desktop is widely used in almost all types of industries one could think of, a bunch of remote desktop software can now be purchased and downloaded online. These products typically target IT help pros and managed service providers who provide a wide range of IT services. However, more and more businesses are also starting to acquire such technology in hopes of achieving a more flexible work experience for their employees. Some of these products can be downloaded for free, so there's really no excuse for not trying to add remote desktop to your organization. And that's all there is to it. There are still plenty of ways you can setup easy remote desktop for your business and work functions. Fortunately, knowing how to setup remote desktop is incredibly easy to understand and execute. So if you ever find the opportunity to add remote desktop to your enterprise, do it while you can. You'll be surprised by how beneficial it is for your business. Does Installation of Remote desktop is helpful?